MTEX 3200UK based Digital Print Innovations Ltd (DPI) has recently launched a virtual demonstration video promoting the new MTEX Digital Textile Printer with in-built sublimation unit. The company was founded in 2009 to offer versatile, high-speed production inkjet printers and finishing equipment for grand and wide-format applications to the UK and Ireland. Direct to substrate options feature highly in their product range which includes printers such as the Inktec Jetrix UV Flatbed printer and Virtu RR50 and Virtu Abacus and Quantum RS35 & RS25 from Polytype in addition to the ESKO flatbed cutter series and software. DPI is also the exclusive distributor for the recently launched MTEX 3200 and 1600 wide direct to textile printers with in-line sublimation. The MTEX was launched at FESPA in Barcelona this year and DPI secured the rights to distribute the product in the UK and Ireland after rigorous testing. The new demonstration video shows the MTEX 3200,installed at Digital Print Innovation’s Centre, and explains how the printer works, the benefits and features, the pitfalls of some direct to textile printing and what to look for when making purchasing decisions. DPI commented that the MTEX 3200 wide digital textile printer brings excellent quality printing with brilliant, vivid colours at a price point never before available. The unit, based upon the industry proven Mimaki JV5 is available with a four colour variable drop, (double CMYK) inkset, in 3.2m or 1.6m wide and boasts an inline dye-sublimation fixation unit and vapour extraction unit. 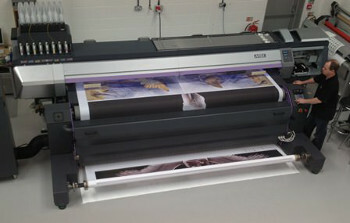 The MTEX 3200 prints to a maximum resolution of 1440dpi x 1440dpi, with 7-21 picoliter variable drops in four staggered high resolution Epson DX5 heads. The fixation unit has 12 high resistant, individually controlled infrared heaters to provide even temperatures across the whole width of the fabric, including the outside ends. DPI said that the open system to load/unload material means its’ quick and easy to replace textiles and manage media when required with little or no fuss. Servo engines integrated into the take-up roller ensure that the step is perfectly synchronised throughout the printing process. The fixation unit, though integrated, is set forward of the printer thereby eliminating any contamination issues such as ghosting. An integrated extraction unit also stops any oil contamination issues, thereby printed fabrics can be finished quickly and easily, saving time, money and energy. DPI is well known in the UK and Ireland for their dedicated team of technical support and service, which is critical when purchasing a large piece of capital equipment. They stock and distribute inks and parts and on top of their hardware range, they supply and support a variety of leading software RIP packages including Caldera, Onyx, Ergosoft and workflow solutions from ESKO. The DPI centre is based in Derby, which is very centrally located for East Midlands Airport (30 mins), Derby train station (2 mins) and the M1 (10 mins) and is available for booked demonstrations throughout the year.